FireGirl loves to dance. Loves it. Loves. It all started back in December. I was flipping thru the channels and The Nutcracker (as in, the ballet) was on one of the PBS stations. And she told me to go back. She sat there and watched the ballet, entranced, for about an hour, before she got up and started mimicking the dancers. So now she likes to watch dancing on television. Ballet and hip-hop appear to be her favorite. She does her best to mimic their moves. And at random times she'll just find a way to play music, usually with one of her toys, and start dancing. And I'm her willingly captive audience. Personally (not that I'm biased at all), I think she's awesome. 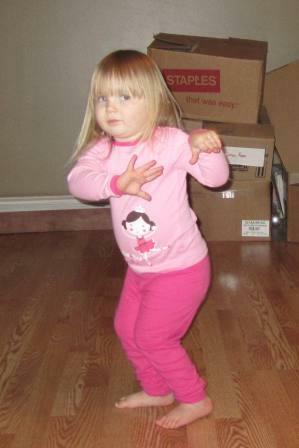 The best little two-year-old dancer in the world as far as I'm concerned. These are some pics from one of her living room performances. I wish these pictures captured even half of how amazing she is. You may have a future ballerina! Do you have any dance studios close to you? It might be fun for FireGirl to take dance lessons...from a girl who grew up a dancer, I can say that the years of dance lessons were well worth it. LOVE IT!! You know my little girl loves her dancing and always has. You should try to find her classes they start at 21/2 to 3 a lot of places and it looks like she's got great balance and coordination already. She's so CUTE! There are many places around us that offer classes for her age. I've been doing research myself to find a tumbling/gymnastics type program for my fire boy. I've been told by many it will make him even better for sports. My champ can start sports in the fall :) Cute Pictures! Let me know if you want me to pass on the info.